I'm impressed with all the different craft skills you have, Toby. These are really neat. I love them. You clever thing Toby! I particularly like the blue ones, like little Dresden plates. they are amazing toby. so full of colour. dx. They are simply lovely Toby, what a good colour sense you have - and you have just given me a great idea for how to make wheels for my toys! What kind of clay do you use? Like, Wow! Hippie psychedelic buttons! Cool, man! 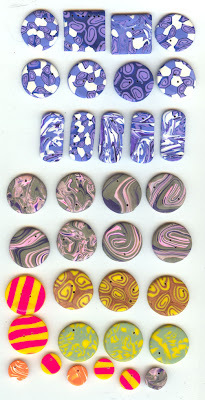 I use polymer clay to make these, eg. fimo or sculpey. You just bake it in the oven! Do come and have a mint tea in Marrakech in May. you will LOVE Essouira.......an artist's dream. Keep in touch via the blog. They are wonderful and what lovely colours I look forward to seeing what jewellery you make with them. Very nice Toby!! Like the blue ones the best me old mucker!! I love the detail on the disks. The blue ones are so beautiful - very much like Millefiori. The others have a very psychedelic feel to it. They'd look great with ribbons or thin suede or some of the soft rubber string you can get in funky colours.